Mounting hole cable ties are effective for use in a wide variety of cable and wire bundling applications that require that a wire or cable bundle be attached to another surface such as a control panel, wall, or ceiling. The one piece construction with a mounting hole feature outside the head of the tie allows for consistent performance and reliability. This design allows for use of a screw or rivet for clamping. The wire or cable bundle can be bundled before or after the clamp is in place. 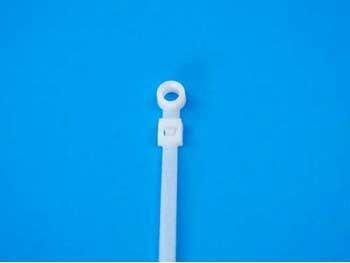 Mounting hole cable ties are recommended when position is critical or the application requires the product be premounted to a surface before final assembly. Natural mounting hole cable ties are preferred for indoor use applications while UV Black is recommended for outdoor applications, providing greater resistance to ultraviolet light. Mounting Hole cable ties are available in various lengths and strengths ranging from 4” – 16”. Strengths available are 18 lbs., 40 lbs., 50 lbs., and 120 lbs. Packaging of the Mounting Hole cable ties are in bulk 1000 piece bags or smaller 100 piece bags. Tensile Strengths – 18 lbs – 120 lbs.